Whispers in the Loggia: Here Comes "Armageddon"
Sure, their post-mortem nice-nice might be reflecting a collective silence -- or, given pre-electoral events, a convenient epidemic of amnesia -- over the ascent of the first Catholic VP... but thirty-six hours in, the bench's "nightmare" lurches onward. In its latest development, another altar-railed Democrat has emerged in contention for a key Cabinet slot: Kansas Gov. 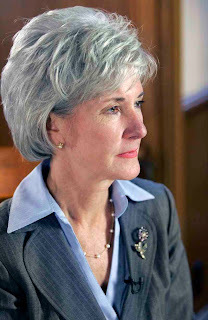 Kathleen Sebelius... who's already doing the DC side-step. Setting the stage for the US hierarchy's first "Armageddon" with the Obama administration, transition sources have floated two pro-choice Catholics -- Sebelius and former Senate majority leader Tom Daschle -- as the leading candidates to head the Department of Health and Human Services, the Federal government's lead agency on abortion policy (and, what's more, the appointee who'd be charged with shepherding the party's pledged Freedom of Choice Act through Congress). The president-elect is long on-record with his "love" for the lame-duck Kansas chief -- a product of Catholic education who's term-limited out of office in 2010. Back home, however, Sebelius' relations with her ordinary are a bit more complicated. After her April veto of a bill that would've restricted late-term abortions in the Midwestern state, Archbishop Joseph Naumann of Kansas City publicly called on the governor to refrain from the Eucharist. An early supporter of Tuesday's winner -- who's called her "as talented a public official as there is right now" -- Sebelius' summertime presence on the then-nominee's vice-presidential shortlist was publicly panned by the Jayhawk prelate, who said that "it would be a bad judgment on Senator Obama’s part to select someone who was in conflict with the church." "One of the things that I said when I met with the governor at one point," Naumann added, "is that some day she’s going to have to stand before God and account for her public service. And I hope that she’s going to have something better to say than what she does to this point on the protection of the innocent unborn." By most accounts, the ecclesiastical limbo wrought by Sebelius' pro-choice record short-circuited her chances in the Veepstakes... thus opening the door for the governor to instead bring her conflict with the Magisterium to the Federal agency that oversees abortion policy... in an administration that, so a goodly number of the bench has unstintingly stated in unprecedented fashion, will be the most "pro-abortion" ever to come to power... all thanks in large part to the swing of the Catholic vote. Some'll say "Checkmate!"... others, "Excommunicate!"... and that's just among the bishops. Speaking of which... one of this campaign season's most forceful episcopal voices on the primacy of the life issues, the St Louis-born Naumann is a finalist for the USCCB's most-prominent committee chairmanship: that of the bishops' pro-life efforts, the winner to be determined at next week's plenary in Baltimore. In a study of contrasts that'll serve as the body's de facto referendum on its preferred approach to Catholic pro-choicers in public office -- and, by extension, both a White House and Congressional majorities overflowing with them -- the bishops' vote pits Naumann against Cardinal Daniel DiNardo of Galveston-Houston, whose own outspokenness on the topic has tended to veer toward a more diplomatic public tone. A protege of the current pro-life chair Cardinal Justin Rigali -- who ordained him a bishop in 1997 -- Naumann handled the committee's agenda at the bishops' June Meeting in Orlando in the Philadelphia prelate's absence. Personalities and approaches aside, however, the conference's tradition convention favors the South's first-ever cardinal -- over Pro-Life Activities' three-decade history, the bishops have invariably entrusted its chair to a prelate with a red hat. Yet regardless of who takes the vote, one significant change is even now assured. More often than not, the post's history has seen it awarded as a final "spotlight" in the victory lap of its occupant's active ministry. But this time around, with both contenders a staggeringly young 59, the bishops have already chosen the path toward a more assertive and vigorous handling of their main issue... all that remains to be seen is how high-octane they want its lead messenger to be. "God Calls Us to Work Together"